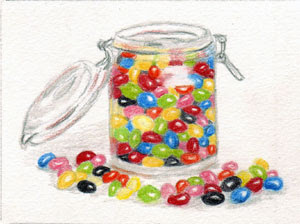 Sherry's Colored Pencil Corner: Illustration Friday - "Total"
This topic gave me pause at first, but then I thought of that old "guess the total" game I've played at so many bridal and baby showers...and jellybeans are just so much fun! ACEO size, Polychromos on Rising Bristol white vellum. What a fun illo! It made me smile! Love the color! I guess 244. what did I win??? what a great idea...and very nicely drawn. Very fun! I've played that game many times before. I never seem to win.